At the mid-point of the South African stonefruit season, exporters have said that despite a more positive outlook for the rest of the season, the last few weeks have been challenging. The South African plum crop could drop by as much as 3m cartons this year, from 12.3m cartons in 2017 (the last non-drought affected season) to 9.6m cartons. “The good news is that Fruits Unlimited growers are now only getting into third gear," he continued. "We had a few strong weeks with the new varieties Midnight Gold and Polaris, which were shipped in week 3 and week 4. Flavour King remains a great pluot and undoubtedly one of the best flavoured plums, he explained, adding that there was not enough fruit and volumes would be down for the fifth year in a row. “We at Fruits Unlimited, are constantly trying to improve our stonefruit business and what better way than to improve eating quality for the satisfaction of our clients as well as the consumer,” said Muylaert-Gelein. “There are several ways to do this, for instance the development of new improved varieties, but one very important but often neglected option is to seek the best of a combination of naturally nutrient balanced soil, slope and micro climate." On the apricot front, he said that the company was happy with "very satisfying" Faralia and Farely volumes coming into the mix. The varieties extend the South African season into January and February and have good flavour. 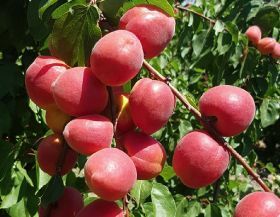 “The attractive blush will surely make this a must for any customer interesting in extending the Southern Hemisphere apricot season,” Muylaert-Gelein outlined.